Within the north Florida gardening community, it would be difficult to find anyone who hasn’t heard of Nathan Ballentine — though they might know him by a different name. Ballentine, a native of Tallahassee, prefers the handle “Man in Overalls,” and he’s nearly always dressed to match his moniker. A gardener since the age of eight, Ballentine has a passion for every aspect of food and enjoys sharing his expertise with others. Ballentine graduated from Warren Wilson College in 2008, where he received a Sullivan Award. Everything seemed to be lining up nicely until the Great Recession took hold of the American economy just as he was primed to join the workforce. Bleak employment prospects weren’t enough to discourage Ballentine — in fact, they awakened his entrepreneurial spirit. 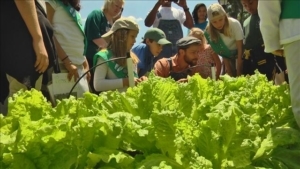 In 2009, Ballentine launched Tallahassee Food Gardens, a business aimed at helping people start their own gardens through several interrelated services. He builds gardens, consults with would-be gardeners, offers workshops, and even sells high-quality compost. 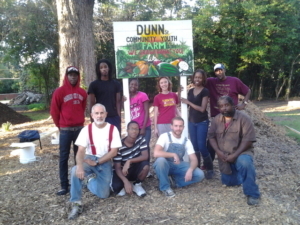 As in any business, turning a profit is essential but Ballentine, a disciple of the Good Food movement, maintains that Tallahassee Food Gardens has a higher purpose. His early success with Tallahassee Food Gardens and the recognition it earned him meant that he soon became even more deeply entrenched in Tallahassee’s food culture than he could have anticipated. In 2010, Ballentine joined with other area food leaders to found the Tallahassee Food Network, a regional coalition that works to grow community-based good food systems. Through Tallahassee Food Network, Ballentine has managed to produce some very tangible results. The iGrow Whatever You Like program, the network’s youth empowerment and urban agriculture program, started in 2012. In partnership with the Florida Department of Agriculture, Ballentine authored a school gardening guide and started the Fresh for Florida Kids Food Garden, where kids learn about healthy diets and the benefits of home gardening. The impact Ballentine has made on his community has not gone unrecognized. He received Warren Wilson’s College Alumni Distinguished Community Service Award in October 2013 and was named Volunteer of the Year by Tallahassee’s largest newspaper, the Tallahassee Democrat. Ballentine spent 16 months in 2014 and 2015 travelling the world with his wife, Mary Elizabeth, acting as a Tallahassee Food Network ambassador and learning from other cities’ efforts to enhance community-based food gardening. His travels even took him to Sligo, Ireland — one of Tallahassee’s sister cities. Upon his recent return to the states, Ballentine relocated his base of operations to nearby Jacksonville, but his work with Tallahassee Food Network continues and he makes monthly trips back home to ensure the progress made there so far will continue. Ballentine is fond of saying that food brings people together. By his count, more than 200 organization-to-organization partnerships related to the Good Food movement have been forged since he started in 2009. With his continued work, north Florida should be a very tight-knit — and healthy — place to live.